For the last few months I have been suffering from a writer’s block of sorts that has made it impossible for me to write a blog post of any length or substance. I have done other writing, just no blogging so it is a true blogger’s block. This has never happened to me before and I have spent the last few weeks honestly trying to figure out the cause is behind this blockage. 1. I start writing and suddenly I feel as if it has already been said before. What seemed like a brilliant blog post when I thought of it, now feels like it is just rehashing the same conversations that we have been having on libraryland blogs for the last few years. Is it possible that we have blogged to death the whole Library 2.0 movement? I am pretty sure we have. If we have, what is the next big discussion topic on the horizon? 2. I start writing on a timely topic but I don’t have time to finish and by the time I go back to polish it off it is no longer relevant or timely. My responsibilities at MPOW have increased greatly since I was promoted to Programming Coordinator, my son is older and involved in activities that require me to be the chauffeur, our older home is undergoing some renovations, and I have begun doing a lot more speaking engagements once more . All of these factors leave me with no time for sustained thinking or writing. I used to blog late at night, but lately my brain is exhausted by that point and when I do write it is mostly gibberish (trust me on this). 3. I start writing and feel like I am writing too much about MPOW and all the awesome things we do here. This is not the intended focus of Library Garden — all the bloggers on our team agree that we want it to be a broader conversation about libraries rather than a simple “how I did it good” type of reporting. Not that we haven’t posted occasionally about cool things we are doing at our libraries or places of work, but we want LG to be more than that and I am aware of this. However, I am so focused these days on planning and running programs that I have little left in me at the end of the day to discuss. 1. Write on a Schedule: This is not likely to happen unless I start getting up at 5:30 am as is my only free unscheduled time at this moment that I could regularly guarantee nothing else happening in my day. I am a morning person, but even that is too early for me. 2. Set Deadlines and Keep Them: I have a lot of deadlines in my life to keep and I am pretty good at meeting deadlines. Blogging is a hobby and a creative outlet and somehow a deadline makes it feel like more pressure on me and I don’t write well under pressure (actually, I evidently don’t write at all as can be seen by my lack of posts lately). 3. Work on more than one project at a time: I am always working on about 10 projects at a time at a minimum. Maybe not writing projects, but I always have too many things to juggle. I actually think working on too many things is my problem. I can not sustain a single train of thought long enough to write a cohesive and coherent post. I get distracted by too many other pressing tasks. 10. 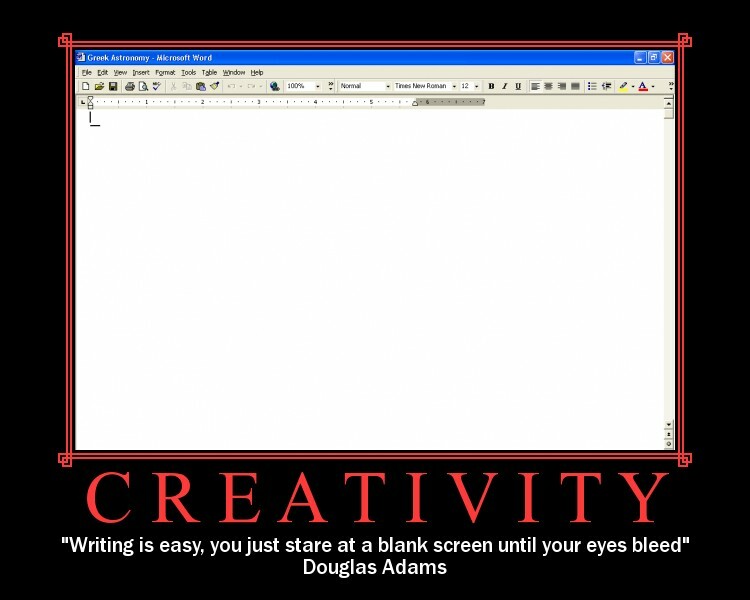 Lastly, write about having writer’s block. Seriously! Write about why you feel stuck. What is it that seems to be keeping you from writing? Free associate and write about it. When you get down to the reasons why you have writer’s block, you can address them and correct them. I wrote this post when I was exhausted. I know it is not perfect or the best writing I have ever done, but at least it is a post to get me out of my rut. I have also analyzed the reasons for my blogger’s block and now that I have one post out again I am already excited about another post that I started working on recently. So, with any luck, I will have another post out within 48 hours. I am looking forward to attending the OCLC Blog Salon at ALA Annual in Chicago this year — and now that I have actually written a post I won’t feel like a fraud for attending. Oh, and if you plant to attend the blog salon, there is a Facebook page so RSVP today! Entry filed under: Blogging. Tags: blogger's block, blogging tips, writer's block. 4 out of 5 Library Gardeners Recommend Twitter to their Readers who Chew Social Media	Teaching Generation M handbook–"hot off the presses!" Sounds like a pretty normal thing to happen. If you started your blog in 2006 as your archives indicate, it makes sense that this would happen now. It has happened to me various times, with exactly the symptoms you described, particularly the symptom of "I start writing and suddenly I feel as if it has already been said before". It has nothing to do with blogging Library 2.0 to death — it has to do with the fact that you as a writer don't want to be going on and on about the same things all the time, regardless of what you are writing about. I tried to reinvent my blog a couple of times, trying to refocus what I was writing about, but this problem just kept reappearing after a while. I guess it's related to the reason why Bill Watterson stopped drawing Calvin and Hobbes, and why Garfield stopped being funny a long time ago. Repetition is a writer's worst enemy. I guess it shouldn't even be called "block" because you actually have things that you want to write about — it's just that you realize it doesn't satisfy you as a writer. My blog went quasi-dead (one post per month or so) for most of 2008 because of that very reason, and I lost hundreds of readers that way. My solution? I accepted the obvious and sent the blog on a hiatus. Instead I used the web space to write a crime novel in blog form, thus proving it wasn't writer's blog at all, but more a dissatisfaction with my previous blog content. In mid-June, after the crime novel was finished, I resurrected my blog with a slight change in focus. So far I find that I have no trouble coming up with ideas for entries that I find blogworthy, but after less than two weeks it's hard to say how long it will last. When ever I have blogger's block, I rely on my students. Since I am a reference librarian, I am supposed to be writing for my students; however, as most librarians know, we tend to forget our students are not research experts. If I have a block, I listen to my students, especially those in my area, and find out what they are having difficulty with, what frustrates them, or what they love. It usually takes about 48 hours before I have a great topic that I know people will actually use. I think you have a point about the 'it has already been said'. There are a lot of library blogs, even more tech blogs, and a lot of web 2.0 has indeed been said. I find it hard and I am a new blogger. That said, when I speak with you, there is never a shortage of ideas, topics, insights, and humor. I think your block comes from the insane amount of work you do (don't forget on top of the full-time gig, you created, organized, and attended a library camp). I think we all need to find a new way to speak of library topics–there is a bit of heard it all before. I think posts like Amy's about Twitter are a very real way to move the discussion forward. It wasn't just a look at this great application post, but a post about a tool that is used, misunderstood, and in general still in the Beta phase for libraries. Thanks for sharing your stories with me Horst and Ammie. It is the sharing aspect that I like most about being a part of the library blogger community. Thank you for the words of encouragement Cynthia. Your comments really made my day. I have had a few other people respond on Facebook and other places to say that my post has spurred them on to get a blog post finished or get blogging again. Sometimes the grind of blogging can wear you down, but it always feels good to get going again. So that’s the case? Quite a reveltoian that is. I wish I'd get writer's block, then maybe I'd get other things done.